The 'Diatto-Clement Societa Anonima' was born in 1905 from an accord between Diatto (a Turin based company since 1835) and Clement (a Paris based company) in order to construct cars known as the 'Torino' at Turin. 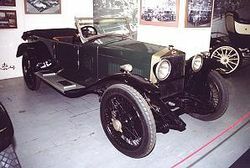 These were actually licenced products from the latter company.The first car was the 20-25HP which used a 3770cc four cylinder engine, followed the year after by the 10-12HP (1884cc two-cylinder) and the 14-18HP (2724cc four-cylinder). The success of these models led to more being introduced, including a six-cylinder model. In 1909 Clement left the business and the company was renamed 'Societa Fonderie Officine Frejus'. The first real Diatto design appeared shortly afterwards, the 16/20. Production proceeded at around 250 to 300 cars per year. 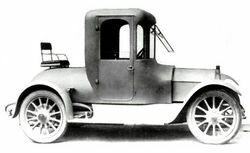 During the first world war new models continued to be introduced (the 18HP, 20-25HP and 30-40HP) as well as chassis' for light commercial vehicles for the military. Diatto 30 (1925)An expansion program led to the purchase of various companies in and around Turin (including Scacchi, the builder of the Storero brand cars and Newton, builder of cars badged NB) whose experience, equipment and plans were all used by Diatto. A bodyshop was also founded for the internal production of the bodies. After a brief name change in 1918, in 1919 the company became 'Societa Anonima Automobili Diatto'. Financial problems followed the war, but cars continued to be developed and produced. The Tipo 10 was a small car with a 1018cc four-cylinder engine, whilst the Tipo 30 was built under licence from Bugatti and included a four-valve-per-cylinder 1452cc four cylinder engine (later increased to 2-litres) with around 30bhp. Following liquidation in 1923 a new company was formed in 1924 with new investors. The Tipo 20 family (20, 20A and 20S) was released, and a Grand Prix car was developed using a supercharged 2-litre dohc eight cylinder powerplant. Interestingly this car was originally designed by Giuseppe Coda and developed further by Alfieri Maserati. The economic situation at the time was, however, not to be denied another victim and in 1928 the last cars were produced. The company continued to produce some spare parts and components until the 1950s when it was totally absorbed into 'S.p.A. G. Veglio & C.'. The "Diatto 20s" who came to drive in the 1 April 1922 Targa Florio, with 3 cars, the No. 15 driven by Guido Meregalli, No. 16 entrusted to Domenico Gamboni and No. 17 drivin by Massola, but all three cars did not finish the grueling race. The Diatto's flew along streets fabulously, bringing the number of chassis 20069th en ° Engine 20066. Massola unfortunately did not finish the race, like the other two races with drivers Diatto Meregalli and Gambon. Engine - 4 cylinder inline engine capacity 1995, Max 45CV to 2,700 rpm, overhead valves, a cam shaft in the head, Solex carburetor, water cooling. Brakes - Front and rear drum with foot pedal, lever on the transmission. Steering - Worm and Wheel ecoidale. Dimension and weight - Track 1.420mm, 3.100mm pitch, bare weight 900Kg. The Diatto is a trademark Torinese still alive. In fact, the "International Diatto Lda" located in Portugal, with the expressed purpose of achieving a historical log of about 200 cars still exist. On 09 February, 2007, Zagato released a press docket detailing its revival of the Diatto marque, to celebrate its 100th anniversary, with the unveiling of a new all-aluminum sports car, called the Diatto Ottovù Zagato, during the 77th Geneva Motor Show this March 2007. Zagato has since released Official Photos of the upcoming vehicle as of 13 February, 2007. The Diatto Ottovù Zagato is an upcoming sports car designed and built by Milanese coachbuilder Carrozzeria Zagato for two of its clients. Coinciding with the 100th anniversary of the Diatto brand, the car made its official public debut at the 2007 Geneva Motor Show. Back in 1921, Ugo Zagato designed a lightweight and aerodynamic body for the Diatto 25 4DS chassis. Created in 1835 with a Perfected Wheel patent, Diatto made their first car in 1905 and often crossed paths with Zagato in their close collaboration with Ettore Bugatti, the Maserati brothers and Tazio Nuvolari. The word "Ottovù" incidentally means "V8" in Italian. A clear indication of the engine powering this vehicle and show of the car's sporting intent. Zagato released this promotional photo of the Diatto Ottovù Zagato, unveiled at the 2007 Geneva Motor Show.